(1) Sûta said: "After having realized what S'ukadeva Gosvâmî thus said about the verification of the reality of the soul, the chaste son of Uttarâ [Parîkchit] concentrated on Krishna. (2) He [thus meditating for a moment innerly] gave up his deep-rooted and constant selfhood in relation to his body, his wife, his son, his treasury and all his relatives and friends in his undisputed kingdom. (3-4) The great soul from his full conviction inquired after this exactly the way you are asking it me, oh great sages. Being informed about his death he renounced his material intentions concerning the three principles [of civil virtue: the regulation of religious acts, economic development and sense gratification] and everything thereto and thus became firmly fixed in his love for the Supreme Lord Vâsudeva. (5) The king said: 'What you said is perfectly right, oh learned one; free from contaminations you have all the knowledge and make the darkness of ignorance disappear telling stories about the Lord. (6) I would like to hear again from you about the Supreme Lord. How does He by His personal energies create this phenomenal world of the universe that is so inconceivable to even the great masters of meditation? (7) And please tell me also about the way the powerful one arrives at His energies, maintains them and winds them up again. How does the all-powerful Supreme Personality engage His expansions, how does He involve Himself with them, what are His actions then and what causes He to be done [see also canto 1, chapter 3]? (8) Even the scholars, in spite of endeavoring for His sake, fall short in explaining the wonderful, inconceivable acts of the Supreme Lord, dear brahmin. (9) How can He, being one but maintaining many forms, at the same time manifest His different natural qualities in material nature and perform activities in different consecutive personal appearances? (10) Please clear up these questions of mine. You after all, being both of the oral tradition with the Vedic literatures and of full realization in transcendence, are as good as the Supreme Lord Himself.' "
(11) Sûta said: "Upon thus being requested by the king to describe the transcendental attributes of Lord Hrishîkes'a [Krishna as the master of the senses], S'uka thought for a while and then began to reply. (12) S'rî S'uka said: 'My obeisances to the Supreme Personality, who for the maintenance and also the winding up of the complete whole of the material creation, by His pastimes assumed the power of the three modes while residing within all bodies as the One whose ways are inconceivable. (13) Again my obeisances to Him who frees the truthful ones from the distressing controversies of those who follow untruth, my respect for Him who is the form of pure goodness, granting all that is sought by those who occupy the status of the highest stage of spiritual perfection [the paramahamsas]. (14) Let me offer my obeisances unto the greatest of all devotees who, keeping far from mundane wrangling, vanquishes the non-devotees. I bow down to Him who is as great in enjoying the opulences as He is in enjoying His abode in the spiritual sky. (15) Again and again I offer Him my respects who is all-auspicious, for the glorification, remembrance, audience, prayers, hearing about and worship of His person forthwith wipes away the consequences of the sins of all people. (16) The bright ones of surrender at His lotus feet forsake all attachment to a present and planned [material] existence, and realize without difficulty the progress of their heart and soul towards a spiritual existence. Unto that renown, all-auspicious personality I offer my obeisances again and again. (17) Great sages, performers of charity, distinguished persons, thinkers, mantra chanters [reciters/singers] and strict followers can never attain tangible results when they are not dedicated to Him. I offer my obeisances again and again to Him, whom to hear about is so very auspicious. (18) The people of old Bharata, Europe, southern India, Greece, Pulkas'a [a province], Âbhîra [part of old Sind], S'umbha [another province], Turkey, Mongolia and many more entangled in sin, immediately find purification when they take to the shelter of His devotees. 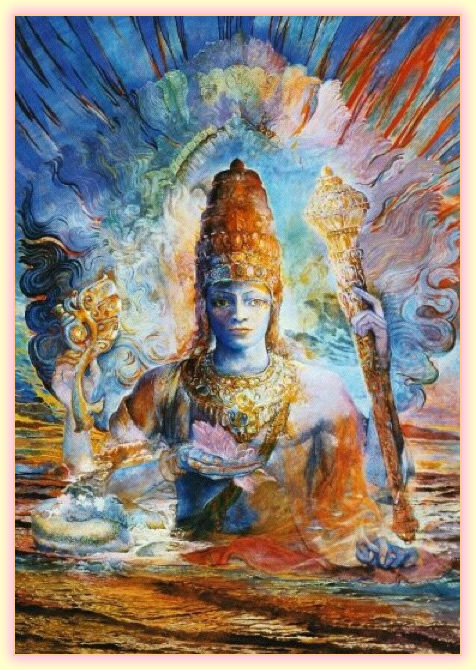 Him, the powerful Lord Vishnu, I offer my respectful obeisances. (19) He is the Supersoul and Lord of all self-realized souls, the personification of the Vedas, the religious literatures and austerity. May the Supreme Lord, He who is held in awe by those who in their transcendence are free from all pretension - the Unborn One [Lord Brahmâ], Lord S'iva and others - always be graceful with me. (20) May He, the Supreme Lord and master of all the devotees who is the owner of all opulence, the director of all sacrifices, the leader of all living entities, the master of the intelligent ones, the ruler of all worlds, the supreme head of the planet earth and the destination and first among the [Yadu] kings of the Sâtvatas, the Andhakas and the Vrishnis, be merciful with me. (21) It is said that faithful to the authorities always thinking of His lotus feet, one in that trance will find purification and arrive at knowledge of the ultimate reality of the soul. Oh Mukunda, my Supreme Lord who is described by the scholars to their liking, may Your grace always be with me. (22) At the beginning of creation Sarasvatî, the goddess of learning who appeared to be created from Brahmâ's mouth, was inspired by Him to strengthen him, the first created being, in the heart with the purpose of the proper remembrance of Himself. May He, that Teacher of Teachers, be pleased with me. (23) He, the Almighty One, who at the foundation of material creation empowers the material creation and her living beings made of the material elements, subjects, as the Purusha [the original person], all to the modes of nature with her sixteen divisions [of consciousness, the elements of earth, water, fire, air and ether, the five organs of action and the senses]. May that Supreme Lord lend charm to my statements. (24) My obeisances unto him, the great expansion of Vâsudeva [Vyâsadeva] who is the compiler of the Vedic literatures from whose lotus mouth his adherents drank the nectar of this knowledge. (25) The first created being [Brahmâ], my dear king, imparted, on the request of Nârada, from the inside the Vedic knowledge exactly as it was spoken by the Lord in the heart.' "
Third revised edition, loaded July 16, 2016. Sûta said: "After having realized what S'ukadeva Gosvâmî thus said about the verification of the reality of the soul, the chaste son of Uttarâ [Parîkchit] concentrated on Krishna. He [thus meditating for a moment innerly] gave up his deep-rooted and constant selfhood in relation to his body, his wife, his son, his treasury and all his relatives and friends in his undisputed kingdom. The great soul from his full conviction inquired after this exactly the way you are asking it me, oh great sages. Being informed about his death he renounced his material intentions concerning the three principles [of civil virtue: the regulation of religious acts, economic development and sense gratification] and everything thereto and thus became firmly fixed in his love for the Supreme Lord Vâsudeva. The king said: 'What you said is perfectly right, oh learned one; free from contaminations you have all the knowledge and make the darkness of ignorance disappear telling stories about the Lord. I would like to hear again from you about the Supreme Lord. How does He by His personal energies create this phenomenal world of the universe that is so inconceivable to even the great masters of meditation? And please tell me also about the way the powerful one arrives at His energies, maintains them and winds them up again. How does the all-powerful Supreme Personality engage His expansions, how does He involve Himself with them, what are His actions then and what causes He to be done [see also canto 1, chapter 3]? Even the scholars, in spite of endeavoring for His sake, fall short in explaining the wonderful, inconceivable acts of the Supreme Lord, dear brahmin. How can He, being one but maintaining many forms, at the same time manifest His different natural qualities in material nature and perform activities in different consecutive personal appearances? Please clear up these questions of mine. You after all, being both of the oral tradition with the Vedic literatures and of full realization in transcendence, are as good as the Supreme Lord Himself.' "
Sûta said: "Upon thus being requested by the king to describe the transcendental attributes of Lord Hrishîkes'a [Krishna as the master of the senses], S'uka thought for a while and then began to reply. S'rî S'uka said: 'My obeisances to the Supreme Personality, who for the maintenance and also the winding up of the complete whole of the material creation, by His pastimes assumed the power of the three modes while residing within all bodies as the One whose ways are inconceivable. Again my obeisances to Him who frees the truthful ones from the distressing controversies of those who follow untruth, my respect for Him who is the form of pure goodness, granting all that is sought by those who occupy the status of the highest stage of spiritual perfection [the paramahamsas]. Let me offer my obeisances unto the greatest of all devotees who, keeping far from mundane wrangling, vanquishes the non-devotees. I bow down to Him who is as great in enjoying the opulences as He is in enjoying His abode in the spiritual sky. Again and again I offer Him my respects who is all-auspicious, for the glorification, remembrance, audience, prayers, hearing about and worship of His person forthwith wipes away the consequences of the sins of all people. The bright ones of surrender at His lotus feet forsake all attachment to a present and planned [material] existence, and realize without difficulty the progress of their heart and soul towards a spiritual existence. Unto that renown, all-auspicious personality I offer my obeisances again and again. Great sages, performers of charity, distinguished persons, thinkers, mantra chanters [reciters/singers] and strict followers can never attain tangible results when they are not dedicated to Him. I offer my obeisances again and again to Him, whom to hear about is so very auspicious. The people of old Bharata, Europe, southern India, Greece, Pulkas'a [a province], Âbhîra [part of old Sind], S'umbha [another province], Turkey, Mongolia and many more entangled in sin, immediately find purification when they take to the shelter of His devotees. Him, the powerful Lord Vishnu, I offer my respectful obeisances. He is the Supersoul and Lord of all self-realized souls, the personification of the Vedas, the religious literatures and austerity. May the Supreme Lord, He who is held in awe by those who in their transcendence are free from all pretension - the Unborn One [Lord Brahmâ], Lord S'iva and others - always be graceful with me. May He, the Supreme Lord and master of all the devotees who is the owner of all opulence, the director of all sacrifices, the leader of all living entities, the master of the intelligent ones, the ruler of all worlds, the supreme head of the planet earth and the destination and first among the [Yadu] kings of the Sâtvatas, the Andhakas and the Vrishnis, be merciful with me. It is said that faithful to the authorities always thinking of His lotus feet, one in that trance will find purification and arrive at knowledge of the ultimate reality of the soul. Oh Mukunda, my Supreme Lord who is described by the scholars to their liking, may Your grace always be with me. At the beginning of creation Sarasvatî, the goddess of learning who appeared to be created from Brahmâ's mouth, was inspired by Him to strengthen him, the first created being, in the heart with the purpose of the proper remembrance of Himself. May He, that Teacher of Teachers, be pleased with me. He, the Almighty One, who at the foundation of material creation empowers the material creation and her living beings made of the material elements, subjects, as the Purusha [the original person], all to the modes of nature with her sixteen divisions [of consciousness, the elements of earth, water, fire, air and ether, the five organs of action and the senses]. May that Supreme Lord lend charm to my statements. My obeisances unto him, the great expansion of Vâsudeva [Vyâsadeva] who is the compiler of the Vedic literatures from whose lotus mouth his adherents drank the nectar of this knowledge. The first created being [Brahmâ], my dear king, imparted, on the request of Nârada, from the inside the Vedic knowledge exactly as it was spoken by the Lord in the heart.' "
The painting is titled: 'Keshava' and is © of Johannes Ptok.